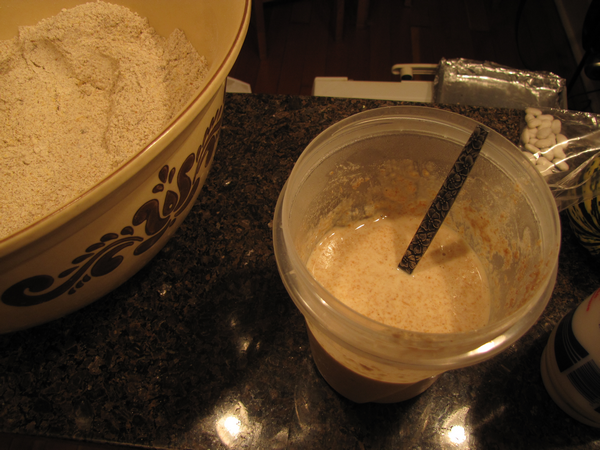 This blog was supposed to be about food too, so in this post I’ll describe how to maintain a sourdough starter and make a simple no-work bread. 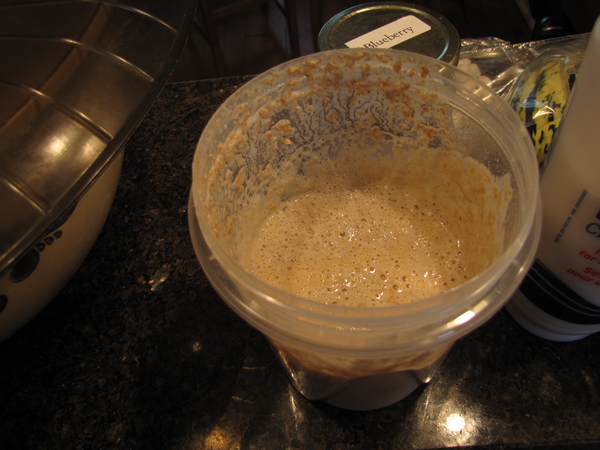 A sourdough starter is a culture of lactic acid bacteria and wild yeasts that is used to leaven bread. (And waffles, pancakes, etc.) 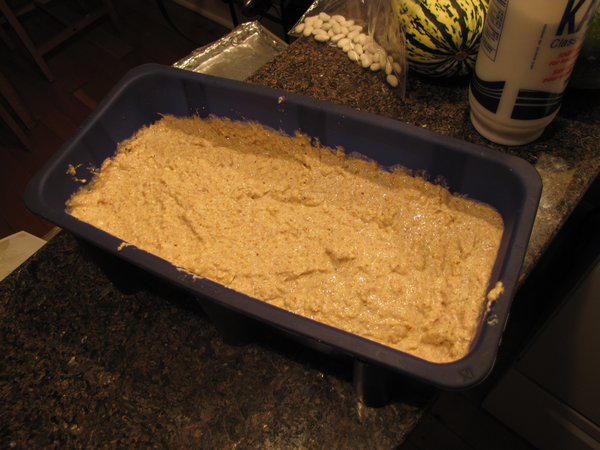 It is more potent than pure yeast, but also adds different flavors to bread. To use it, the first step is to find someone who is willing to share a bit of sourdough starter with you; if that fails, other sources exist. 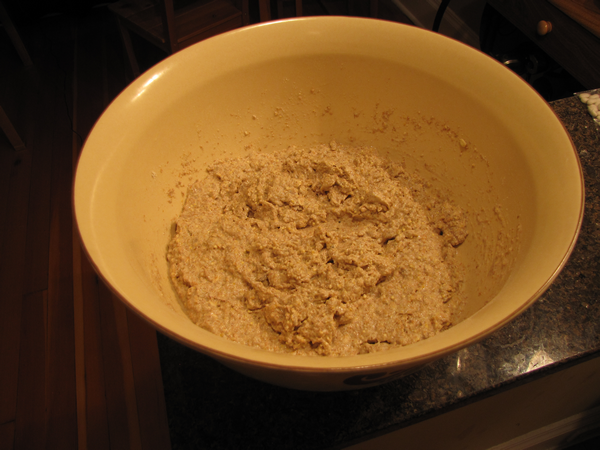 The starter is fed with equal parts (non-chlorinated) water and flour — white, whole wheat, spelt, or rye are probably all fine. 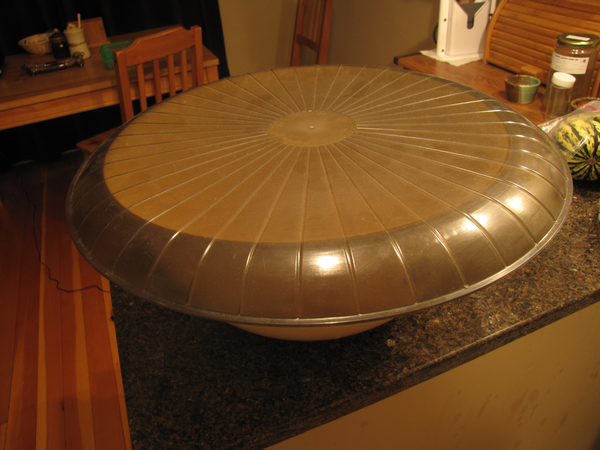 To allow the culture to grow, after feeding it should be kept at room temperature and in a container with an opened lid. Use glass, food-grade plastic, or a stone crock. 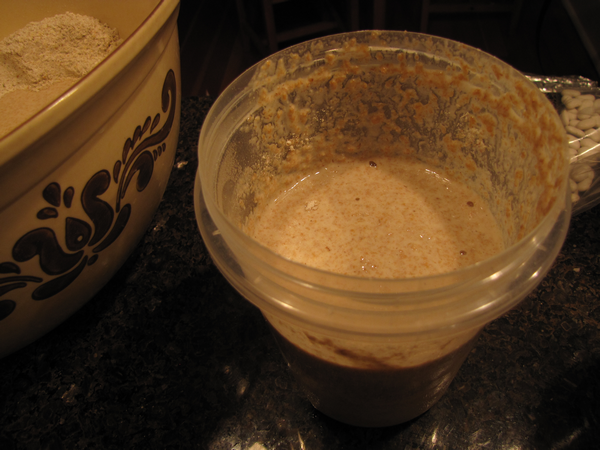 The fed sourdough will start bubbling on top within a day, which means it’s good to go. At this point it can be used, left out for another day or so, or closed and put in the fridge. 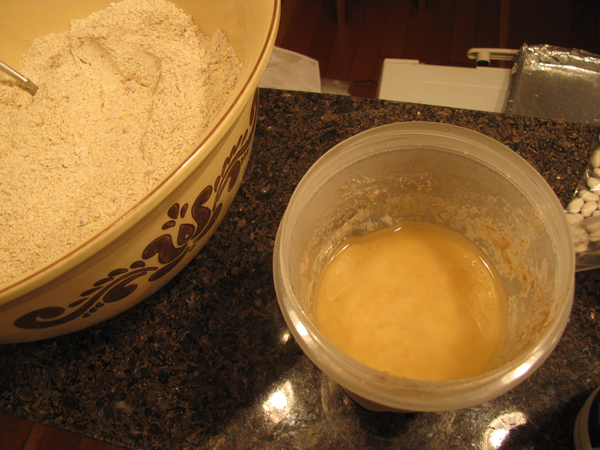 To use it, mix the liquid on top (if any) back in and pour, say, a cup of starter into your dough or batter. Then repeat the previous steps for feeding and storage. I find it stores in the fridge for a few weeks, though the flavor and bacteria/yeast balance will be better if it’s not forgotten for a month. The starter should smell sour and pungent, but not rotten or moldy. As a backup, you should freeze some starter (in an ice cube tray) or dry some. It is also advisable to give some to friends. In addition to serving as backups, they might reward you with baked goods. 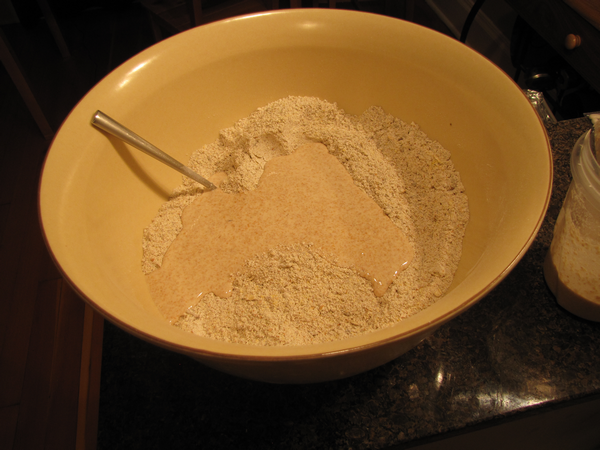 A few tablespoons of any of: rolled oats, flax seed, sunflower seeds, cornmeal, millet, etc. This makes a large loaf. Feel free to scale down or up to fit your containers, though baking time may also need adjustment. 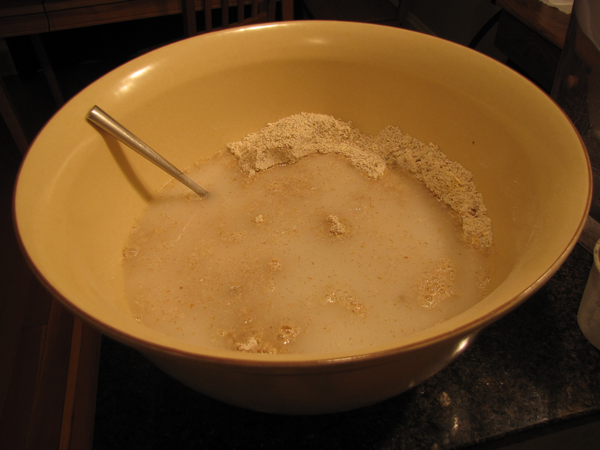 Mix together the dry ingredients in a large bowl. 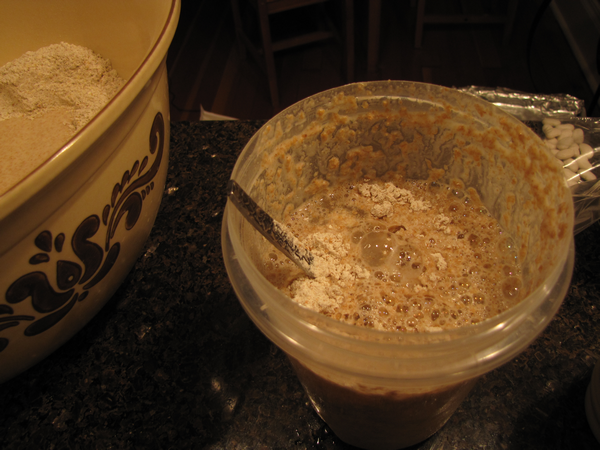 Add in the sourdough starter and water and mix well (a large spoon is fine for this). The result should be a moist dough or thick batter. Add more flour or water as necessary. Leave it covered at room temperature 12-24 hours until it doubles (longer is okay). 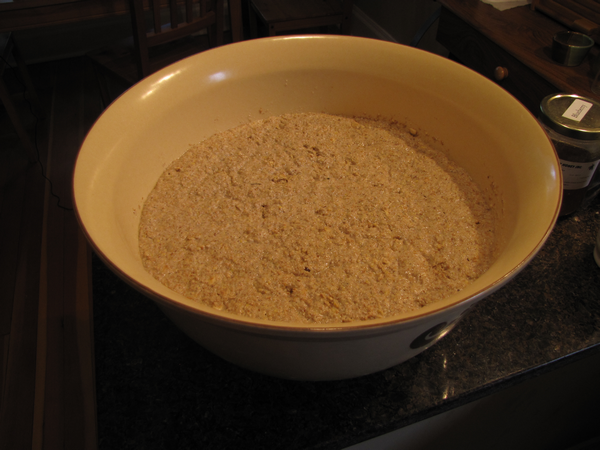 Transfer to a loaf pan that you trust not to stick (though maybe greasing would work). I use silicone for this. Place in cool oven and allow it to rise a second time — a couple of hours. If you are pressed for time, you can probably neglect this. Turn on oven to 425 F and take the bread out 40 minutes later; poking should show the crust to be sturdy. Remove from loaf pan and allow to cool and rest several hours. Store in a paper bag. If you use a ziploc bag, the crust will get soft. To freeze, put in paper bag then a ziploc bag. 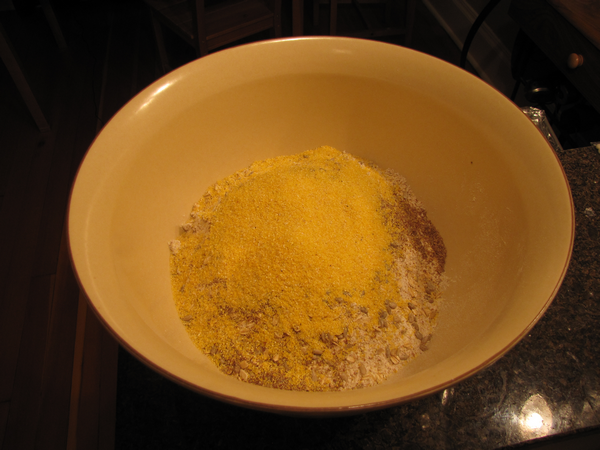 The result is a hearty, moderately dense bread with a somewhat moist crumb, that keeps well. Over time it should just dry out (depending on climate, of course). The process can be sped up by slicing it thin and oven-drying to make biscuits/crackers. The above is just a base recipe. 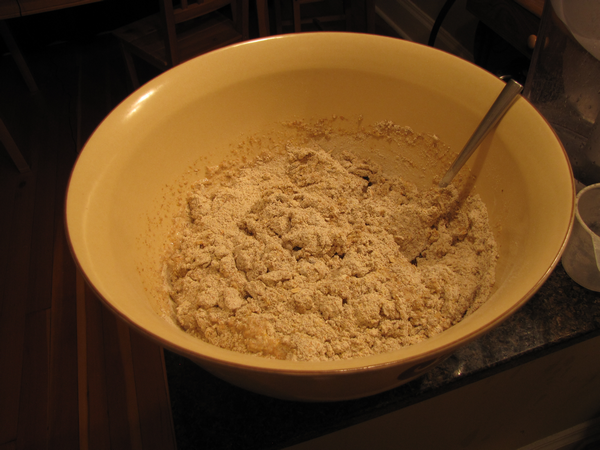 It could be made from any mix of flours, as long as there is a reasonable amount of gluten (for which just rye is not sufficient may work okay) — otherwise the bread won’t rise much. 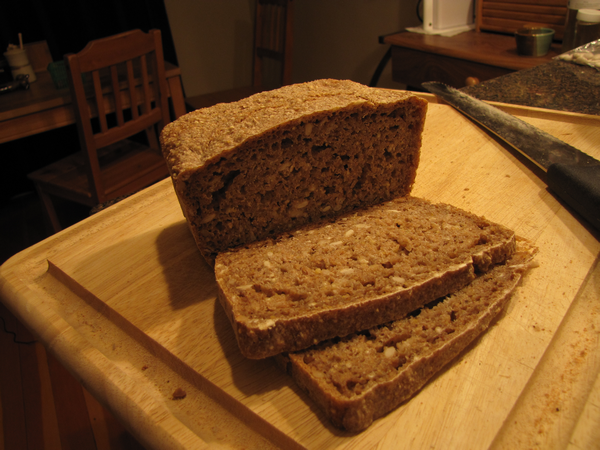 The seeds and grains could be entirely omitted in favor of a simple wheat bread. If you’re willing to put in the work, the bread could be made fancier by making a stiffer dough and baking in a dutch oven; the Internet has more to say on no-knead bread than I care to get into here.